Cable Display Systems provide a strong, yet barely visible hanging solution for most artwork and pictures. Art cables are available in stainless steel and clear nylon. You can use either to create your cable suspension system. They are compatible with a range of adjustable hooks and clamps for a truly minimal and sophisticated feel. 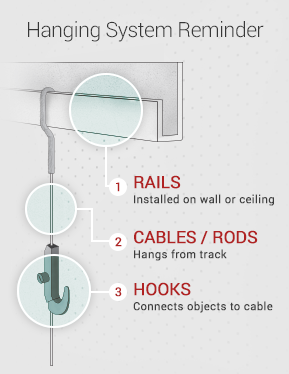 The Slim-Line Picture rail with its 8 pre drilled holes easily mounts to the ceiling and can be used with both hanging cables and aluminum picture rods. Versatile! Discreet! and Easy to install! 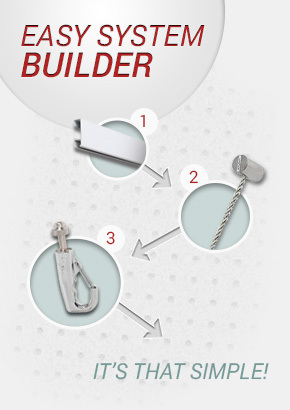 Simply affix the supplied fastening clips to the wall and snap Click-Track to the clips. Fastening Clips and Installation Hardware included. The Click Track Deco with its raised decorative channel mounts to the wall with the use of fastening clips that conceal all fittings and anchors.